Recently my sister welcomed some visitors from Japan – the parents, sister and grandmother of an exchange student she had hosted some years before. All were impressed with the art quilts on the wall and the lovely quilts on the beds. One particular quilt struck them as it featured a Geisha with Japanese writing. They were all very complimentary about the quilts but it was the grandmother that said something profound. She indicated via her grandson, who translated, that she had lived a full, happy and interesting life and was ready to meet her maker – that was until she saw the quilts. She said that she would now have to re-evaluate her sense of accomplishment as she saw that there was a lot more she could do yet. This lovely lady was a teacher in the ancient Japanese tea ceremony and perhaps she was drawn by the simplicity of the quilts, or perhaps the imagination required. Whatever it was quilting managed to reinvigorate her and inspire her to create. What a great story! If you need any more inspiration have a look at the comments that Trudy’s daughters left on the last post. Quilting is such a great pastime – it allows you to be creative even if you’re not that artistic, it gives you a sense of accomplishment when you finish a project (and perhaps a sense of annoyance when those seams just won’t line up). Perhaps you view it as ‘therapy’ or you enjoy the sense of community from being with other quilters and sharing their stories. Maybe it connects you with history and memories of your childhood or connects you with the quilters that came before and becomes a living memorial. Perhaps it is a practical way to keep your family warm or an artistic way to keep their memories alive. It seems to me that quilting can be a lot of things – artistic, creative, practical and even controversial -look at the arguments for and against ‘modern’ quilts on social media sites. It can be frustrating and wonderful in equal measure. What does it mean to you? I’d love to know. Have a happy Easter and travel safely. Here are some free bunny-related patterns for you to enjoy. 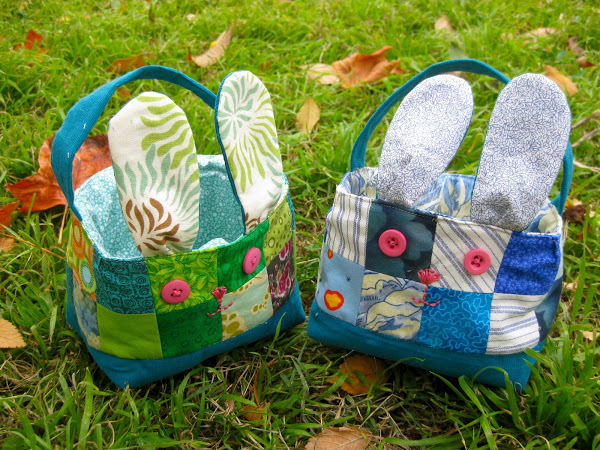 This entry was posted in Free Patterns and tagged Easter by Apatchy Kaye. Bookmark the permalink. Hi Kaye. Thank you for your beautiful inspiring story which really is that. Your sister must have enjoyed the experience of having the Japanese family as guests.